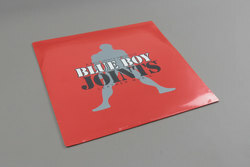 B-Ball Joints (Low Jack) - Blue Boy Joints. Vinyl LP. Bleep. Low Jack follows on from his latest Modern Love album with a bonkers session of EBM rattlers for PRR! PRR! Sub titled 'leather music' Blue Boy Joints is the sound of Low Jack having some serious fun and showing his serious skills in the studio. Hallmarks of his An American Hero and Lighthouse Stories may not be hugely evident, but if you dig those then no matter what way you approach it Blue Boy is gonna have some EBM fun to satisfy you no end.